Per chevron vert and argent three castles within a laurel wreath all with in a boudure invected counterchanged. A Barony in the Northern Region of the East Kingdom, Stonemarche was formally established on October 4th AS 18 (1987). Morgan Arianblaidd and Megan Laine were invested as the founding Baron and Baroness by Randal and Marieke. Meaning: Stonemarche's heraldry is full of allusions. The boudure invected represents the 'Granite State' (A marche is a border area like between England and Scotland. Therefore the device has a stone marche). New Hampshire's White Mountains and Northern Forests represented by the green and white field division. the three castles representing the Shire of Belle Rive, Shire of Vatnaskvadstadir and the Riding of Caer Penbledd uniting to form the Barony. Blazon: Per chevron vert and argent three castles within a laurel wreath all with in a boudure invected counterchanged. Heraldic officer's title: Granite Pursuivant. The Order of the Millstone - granted for long service to the barony. Golden Sword - Awarded to the "fighter (authorized less than a year and not yet fought at Pennsic) showing the most potential as chosen by the veteran fighters in attendance at the Golden Sword Tournament. Golden Foil and Golden Arrow - As per Golden Sword, but in fencing and archery respectively. 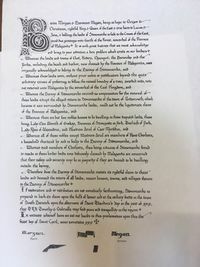 The Barony of Stonemarche overlays the entire state of NH and claims stewardship of Giggleswick (those regions of Maine with zipcode 03***) For more details see below. Originally the Southern part of the area known in the quotidian world as New Hampshire was settled as the Shire of Branswatch in AS 12 (1981). Eventually Branswatch was replaced by four other groups; the Canton of Anrhyfeddôd in AS 13 (1982); the Shire of Belle Rive, in AS 14 (1983); the Shire of Vatnaskvadstadir AS 14 (1983); and the Riding of Caer Penbledd AS 15 (1984). When the Canton of Anrhyfeddôd was disolved in AS 17 the Kingdom Senechal ceded the lands to the Shire of Vatnaskvadstadir as he stepped down from office. At the time, Vatnaskvadstadir, and Bell Rive were negotiating between themselves to determine how to divide the lands of Anrhyfeddôd. After much negotiation, and conferences with the people of Caer Penbledd the three groups decided to join together and form a Barony. Further meetings took place to decide the name of the new Barony, its arms and choose the founding Baron and Baroness. On October 4th AS 18 (1987 C.E.) 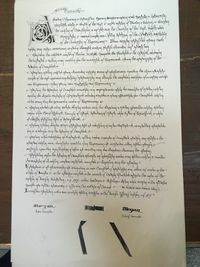 the Barony of Stonemarche was officially created. From times ancient beyond all memory or record, the people of Giggleswick have inhabited the southern region of Malagentia, mundanely corresponding to the southern half of York County, Maine. For many years, the people of Giggleswick suffered under the yoke of Provincial Malagentia, whose officers would scold them for imaginary crimes and confiscate their mead. But Giggleswickians are a proud race, and cannot by nature submit overlong to tyranny. So it came to pass in those days, that there went out a decree from King Gregor II that the whole kingdom should be registered. During the "Great Zip Code Search" of A.S. 29, Seneschal Andre of Branswatch declared in bold fashion (some say accidental) that Stonemarche included all zip codes beginning with "03". Fatefully, the zip codes of Giggleswick also began with "03". Unwilling to let legitimate pretext go to waste, their Excellencies Stonemarche declared war on Malagentia, effective April 1st. Unfortunately, the declaration of war was delivered in Pig Latin. Malagentia didn't realize they were under attack until the following Thursday, and Stonemarche was forced to declare victory by default. Malagentia then reclaimed Giggleswick by force of arms at the Great Northeastern War, only to be confounded by Lady Elen Alswyth of Eriskay, a prominent Giggleswickian, who subsequently declared fealty to Stonemarche on behalf of her people. Only His Majesty, Gregor II, King of the East could settle the dispute, and in his infinite wisdom gave a Royal Edict, that Malagentia shall own the land, and Stonemarche shall own its people. Order of the Millstone Long service to Stonemarche in one of the fields: white cord for service, red cord for martial, green cord for arts. Order of the Keystone Vert Outstanding service at Pennsic, either on the field or in camp. Tabula Rasa Excellence among the youth of the Barony. Other awards: The Baron’s Pearl and the Hammer of Stonemarche are more baronial whims. This page was last edited on 8 March 2019, at 12:40.